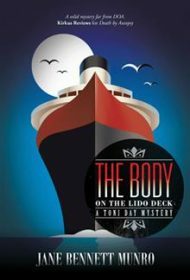 The Body on the Lido Deck is Jane Bennett Munro’s fifth book in her engaging series featuring sleuthing pathologist Toni Day. This one takes the doctor away from the Idaho hospital environment of her previous Death by Autopsy, and into deep waters. Here, Toni is on a Caribbean cruise with her husband, her mother Fiona and her mother’s husband Nigel, a retired Scotland Yard inspector. When Toni goes to the ship’s lido deck to read in the pre-dawn darkness, a severed head falls from above, where a mechanical roof moves into place each morning, and into the swimming pool. Then the rest of the victim falls from the roof and splats on the poolside in front of her. This outrageous beginning takes readers on a fast-paced crime-solving journey. The victim turns out to be a singer on the ship, and Toni and Nigel identify a handful of crewmembers as suspects. It turns out that the murder—and suspects—have connections with other cruise ships on the same line and origins that go back more than two decades. The plot is inspired by the author’s love of cruises, and Munro is herself an Idaho pathologist, so the book’s details about cruise ships and Toni’s forensic knowledge lend the narrative authenticity. The Body on the Lido Deck will keep readers guessing until the action-packed end. And when it’s all over, the story’s satisfying solution will leave them eager to explore Toni Day’s other adventures.